This article is about the superhero. For other uses, see Firestorm (disambiguation). Cover of the first issue of Firestorm the Nuclear Man (March 1978). Art by Al Milgrom. The first Firestorm series was short-lived, canceled abruptly in a company-wide cutback (the "DC Implosion") with #5 (the first part of a multiple-issue story) the last to be distributed, and #6 included in Cancelled Comic Cavalcade. Writer Gerry Conway added Firestorm to the roster of Justice League of America. This led to a series of eight-page stories in the back of The Flash (issues 289–304; with art by George Pérez, Jim Starlin and others), and a revival of a monthly Firestorm comic in 1982. The Fury of Firestorm (later called Firestorm the Nuclear Man) lasted from 1982 until 1990. Another Firestorm series began in 2004 with a new character in the role of Firestorm, Jason Rusch, after Ronnie Raymond was killed off in the pages of Identity Crisis. Rusch was poorly received and his book was canceled after 30 issues and the Ronnie Raymond Firestorm was resurrected in the pages of Blackest Night. Yet another Firestorm title was launched in 2011. Starring both Ronnie and his successor Jason, it was one of the New 52 titles launched in the wake of DC's Flashpoint crossover event. The series, The Fury of Firestorm the Nuclear Men, was initially written by Gail Simone and Ethan Van Sciver and drawn by Yıldıray Çınar. Joe Harris replaced Simone starting in Issue 7, while co-writer Van Sciver also provided the art for Issues 7 and 8 before Çınar returned. Veteran writer/artist Dan Jurgens took over the series with issue #13 in 2012, until the series' end with issue #20 in 2013. In 2016, Firestorm was one of the features in the Legends of Tomorrow miniseries, which united Martin Stein and Jefferson Jackson as Firestorm for the first time in the New 52 universe. The original Firestorm was distinguished by his integrated dual identity. High school student Ronnie Raymond and Nobel Prize-winning physicist Martin Stein were caught in an accident that allowed them to fuse into Firestorm the "Nuclear Man". Due to Stein's being unconscious during the accident, Raymond was prominently in command of the Firestorm form with Stein a voice of reason inside his mind, able to offer Raymond advice on how to use their powers without actually having any control over their dual form. Banter between the two was a hallmark of their adventures. Stein was initially completely unaware of their dual identity, leaving him concerned about his unusual disappearances and blackouts, but Ronnie was eventually able to convince him of the truth, allowing them to bond as separate individuals rather than as parts of a whole. After the accident, Firestorm took to defending New York City from such threats as Multiplex and Killer Frost. The 1982 series began with the teenaged Raymond adjusting to his newfound role and later delved into the issue of the nuclear arms race. The Fury of Firestorm slowly developed the lives of Raymond and Stein, as the teenager struggled with high school and moved towards graduation and the scientist found a life outside the lab after learning about his bond with Raymond. A second nuclear hero, Firehawk, was added as a love interest for Firestorm in 1984. The series also tried to create a sense of fun, something that Gerry Conway felt was missing during his years writing Spider-Man; the banter between Ronnie Raymond and Martin Stein contributed to this. Upon graduation from high school, Raymond entered college in Pittsburgh, where Stein had been hired as a professor. Afterward, together they searched for a cure for their bond. The Firestorm with Arkadin proved to be a transitional phase, as in 1989 Ostrander fundamentally changed the character of Firestorm by revealing that Firestorm was a "Fire Elemental". Firestorm now became something of an environmental crusader, formed from Ronnie Raymond, Mikhail Arkadin and Svarozhich, a Soviet clone of the previous Firestorm, but with a new mind. Professor Stein, no longer part of the composite at all, continued to play a role, but the focus was on this radically different character. New artist Tom Mandrake would create a new look to match. It was during this phase that Firestorm met and befriended Sango and the Orishas, the elemental gods of Nigeria. He also met their chief deity and Sango's older brother Obatala, Lord of the White Cloth. By the series' 100th issue, Stein learned that he was destined to be the true Fire Elemental and would have been were it not for Raymond also being there by circumstance. Raymond and Arkadin were returned to their old lives, and Stein as Firestorm was accidentally exiled to deep space in the process of saving the Earth. He thereafter spent many years traveling through space as a wanderer, returning to Earth only rarely. After the transition to the elemental Firestorm, all of the main characters from the series vanished from the comics for some time after the cancellation of the Firestorm comic in 1990. Raymond eventually returned in the pages of Extreme Justice. Raymond, at the time undergoing treatment for leukemia, regained his original powers after a chemotherapy session. It took the combined might of the Justice League led by Captain Atom, and the returned elemental Firestorm, to restore Ronnie's health. Firestorm began to appear regularly in a number of DC titles, though lacking the guidance and knowledge necessary to use his skills wisely. Firestorm was drafted by Batman into a "replacement" Justice League that was commissioned in case something befell the original team (in this case, being stranded in the distant past in "The Obsidian Age" storyline). After the original team returned, Firestorm stayed on as a reserve member and participated in events such as a team-up with the Justice Society of America (in JLA/JSA: Virtue and Vice) and the intercompany crossover JLA/Avengers. He was also briefly a member of the Power Company. Ronnie Raymond was killed during the Identity Crisis mini-series. During a battle with the villain Shadow Thief, Raymond was impaled by the Shining Knight's sword, which the Shadow Thief had stolen. The magical sword ruptured the nuclear man's containment field, resulting in Firestorm's body exploding and his residual essence funneling into the body of Jason Rusch, the new host of the Firestorm Matrix. His name was featured posthumously on Rip Hunter's chalkboard in Booster Gold (vol. 2) #1 in the statement "Ronnie Raymond + X = Firestorm". In 2004, DC revived the Firestorm comic for the second time, with writer Dan Jolley and artist Chris Cross, but instead of the original Firestorm, Ronnie Raymond, there was a new protagonist; the teenager Jason Rusch. Jason was a seventeen-year-old living in Detroit, who wanted nothing more than to escape his home city. He lived with his father who had turned abusive after he lost his hand in an industrial accident. His mother left the family sometime after the accident. With the loss of a job he needed for college tuition, Jason turned to a local thug for money, accepting a job as a courier. It was on that job that he encountered the Firestorm matrix, searching for a new host after Ronnie Raymond's death. In the aftermath, Jason struggled to cope with his new identity and powers – a struggle that led to the death of the man who'd hired him. Eventually, Jason managed to develop a degree of control over his powers. Ronnie returned within the Firestorm matrix in Firestorm #9, remaining with Jason as part of Firestorm until he appeared to dissipate in Firestorm #13. Shortly after Jason's eighteenth birthday, a few weeks after Raymond's dissipation, Jason was kidnapped by the new Secret Society of Super Villains for use as a power source in a hidden complex. Freed when the new Secret Six launched a raid on the complex, Jason discovered two important things: he had a fellow prisoner, a mysterious girl named Gehenna, and his imprisonment by the Society had significantly depowered him (Firestorm #17). Together, Jason and Gehenna escaped the complex. Gehenna disappeared in the aftermath, but telepathically promised Firestorm that she'd see him again. In Firestorm #19, Donna Troy recruited Firestorm – this time comprising Jason and his best friend Mick Wong – for her outer space team to fight the oncoming instability from Infinite Crisis. In the 2006 miniseries Infinite Crisis it was revealed that Martin Stein, alive in space as the "Elemental Firestorm", had sensed the presence of Jason Rusch within the Firestorm Matrix, but was unaware of Ronnie Raymond's final demise. When Jason, as Firestorm, was gravely wounded in the line of duty, Stein linked with him in a variation of the merge, promising Jason a new Firestorm body to let him return into battle (although Martin had been unable to save Mick) and asking him about Ronnie's fate. Accepting Martin's proposal, Jason asked Stein to become the permanent second member of the Firestorm matrix. Sensing his "errors" (including Mick's death) were the result of his youth and lack of experience, he sought the experience and maturity of Stein. Stein refused at first, but later accepted Jason's request, thus ensuring both a new Firestorm body and the reconstruction of human bodies for both Rusch and Stein. It was revealed in Infinite Crisis that if the Multiverse had survived up to the present, Jason would have been a native of Earth-Eight. As the storyline jumped ahead a year (and the series itself was now re-titled as Firestorm the Nuclear Man from issue #23 on), Professor Stein has mysteriously vanished, and Jason Rusch has been merging with Firehawk to become Firestorm, allowing him to use her powers as well. The two decided to look for Stein together. Stein had been kidnapped and tortured by the Pupil, a former teaching assistant of Martin's. Flanked by the D.O.L.L.I.s, a group of cyborg soldiers of limited cognitive ability, the Pupil (formerly known as Adrian Burroughs) questioned the nearly dead Stein about the secrets of the universe. Jason and Lorraine, along with the mysterious teleport-er Gehenna, freed the captured Stein and restored him to full health. Jason is a college freshman at New York City's Columbus University and seems to have ties with Dani Sharpe, a member of the senior staff at LexCorp. The Firestorm team of Jason and Firehawk made several appearances across the DCU[expand acronym] before the search for Martin Stein ended. This included dealing with the latest OMAC and teaming up with Superman in the "Back in Action" story arc in Action Comics. Firehawk later introduced Jason to Pozhar, a Russian superhero who was once a part of the Firestorm matrix; together, the trio take on a newly reborn Tokamak. This series ended with Firestorm the Nuclear Man #35 (April 2007). Jason Rusch and Martin Stein meet Shilo Norman, and are attacked in succession by members of the New Gods such as Orion of New Genesis, Granny Goodness's Female Furies, and a greatly augmented Kalibak of Apokolips. Shilo informs Stein and Rusch that one-quarter of the Life Equation is hidden within the Firestorm Matrix. The others are held by Earth's other three Elementals (possibly the Red Tornado, Naiad, and the Swamp Thing). Darkseid fears that the Life Equation might challenge him and his Anti-Life Equation. Orion wished to keep Professor Stein safe, and Darksied's elite wished to secure the Matrix for Darkseid. The Lord of Evil descended upon them, ripped the professor from Rusch within the Matrix, then vanished without a trace. Jason, with Gehenna as a "hidden partner" in their fusion, began his search for the missing Dr. Stein. While apprehending Killer Frost in the commission of a heist, Jason Rusch is severely wounded by Lex Luthor, the Joker, and the Cheetah. While still recovering, he goes to aid the captive members of the Justice League. Upon freeing the members of the League, he joins the battle against the Injustice League. After this victory, Firestorm is drafted into the League by Batman. During the team's encounter with the planet-destroying villain Starbreaker and the black-ops team the Shadow Cabinet, Jason eventually faces Carl Sands (a.k.a. Shadow Thief), the villain who killed Ronnie Raymond and inadvertently caused Jason's transformation into Firestorm. Sands mocks Jason for being an unworthy successor and nearly kills him like he did his predecessor, but Jason rejects the villain's insinuation that he is inferior, and emerges victorious. Jason instead uses his abilities to seal Sands' mouth shut with duct tape, preventing the utilization the shadows within his body, thus rendering the villain powerless. He later assists Icon and the rest of the Justice League in the final battle with Starbreaker. After this, Jason plays a minor role in the miniseries Justice League: Cry for Justice. A short time later, Firestorm is seen helping search for survivors alongside Animal Man and Starfire after Star City is destroyed by Prometheus. In the 2009–2010 Blackest Night miniseries, Ronnie Raymond is called by a black power ring to join the Black Lantern Corps. In the following issue, his reanimated corpse is shown confronting Barry Allen and Hal Jordan alongside Hawkman, Hawkgirl, Elongated Man, Sue Dibny, and J'onn J'onzz. He then attacks Jason Rusch (the current Firestorm), and absorbs him into his own version of the Firestorm Matrix. Then, using Jason's unique abilities, he turns Gehenna into table salt, simultaneously ripping her heart out with a smile. He uses the Firestorm Matrix to absorb Jason's anger over Gehenna's death, providing the Black Lanterns with even more emotional energies. He goes on to attack Barry and co. at the Justice League satellite. Jason then briefly asserts himself, allowing the heroes to escape. Regaining control, Ronnie proceeds to absorb Jason's willpower. Like other Black Lanterns, the undead Firestorm mimics the personality of Ronnie Raymond, often wisecracking and exhibiting other stereotypical teenage behavior. In the final battle against Nekron, Ronnie is restored to life alongside Jason, the two separating from Firestorm. Ronnie is confused, asking Atom where Professor Stein is while Jason is upset with Ronnie killing Gehenna. Ronnie, however, apparently has no memory of doing so. In the 2010–2011 Brightest Day miniseries, Ronnie Raymond, still clad in casual clothing from a wild party the night before, arrives at Jason Rusch's apartment with Professor Stein and Ray Palmer to attend Gehenna's funeral. Stein and Palmer discuss Ron's return and how he no longer remembers anything since his death at the hands of Shadow Thief. While the two talk about the paperwork needed to have Ronnie's legal status as "dead" reversed, Ron approaches Jason and offers an apology about Gehenna's murder. Jason refuses to accept it, telling Ronnie that he forced him into being an accomplice to his own girlfriend's death, and that he probably doesn't even remember her name. When Ronnie is actually unable to remember Gehenna's name, Jason angrily lashes out and punches him in the face. This causes the two young men to merge into Firestorm, and they begin arguing inside the Matrix while Palmer transforms into the Atom in order to help them separate. Palmer manages to separate Jason and Ronnie, but not before the Firestorm matrix causes a huge explosion, trans-mutating everything in the Professor's laboratory into table salt. While recovering in the hospital, Stein explains to Ronnie that it seems to be very dangerous to fuse into Firestorm again. Also, it is revealed that Ronnie, after quickly leaving the hospital and being threatened by Jason's father to stay away from Jason, lied to everyone, as he seems to perfectly remember murdering Gehenna as a Black Lantern. Some time after the forceful separation, he lies sleeping in preparation of a party, when a previously heard voice prods him awake – a monstrous construct of Gehenna, made totally of salt, which proceeds to throttle and choke him, taunting him to remember her name; while she is interrupted before killing him, Ronnie is left covered in salt. Not too long after, he is lying, recovering from a massive binge, when Jason again forces the merge to help several construction workers endangered when the girders at the site are transmuted without warning to bubble gum. This time, they again hear the mysterious voice taunting them, and Ronnie accepts he remembers killing Gehenna, and they realize something else is lurking from within the Firestorm Matrix. As Firestorm, Ronnie and Jason visit Stein in an attempt to find out what is happening to them. Stein reveals to them that the Black Lantern Firestorm still exists in the Firestorm Matrix. Firestorm is then told by the Entity that they must learn from each other and defeat the Black Lantern Firestorm before he destroys the Entity. Somehow, Jason and Ronnie trade places. After running a test, Professor Stein reveals the origin of the Firestorm Matrix. Stein believes that during the initial experiment he was able to capture the spark that preceded the Big Bang that created our universe, thereby making the matrix a trigger for a new big bang. If the boys continue to experience emotional imbalance, they increase the likelihood of triggering a new big bang. After explaining this to the boys, the voice inside them speaks again. Declaring that it is not the matrix, a pair of black hands reaches out from inside Firestorm. Forcibly separating Jason and Ronnie, Black Lantern Firestorm stands between them, separate from both Ronnie and Jason and apparently calling itself "Deathstorm". Deathstorm reveals its plan to Stein, stating that it intends to create enough emotional instability between Ronnie and Jason that the Matrix will trigger another Big Bang thereby destroying of all life in the universe. In order to help accomplish this goal, Deathstorm absorbs Stein's mind in order to use his knowledge of Ronnie against him; then, to torture Jason, Deathstorm brings his father Alvin Rusch to the lab and absorbs him as well. Taking flight Deathstorm beckons Ronnie and Jason (now merged into Firestorm) to follow it. Deathstorm leads them to Silver City, New Mexico and the resting place of the Central Power White Lantern Battery. Deathstorm tries to lift the battery but is unable to until he infects it with black energy, after which he is able to lift it with ease. After he threatens to destroy the White Lantern Battery and therefore prevent Ronnie and Jason to truly live, a voice beckons him not to. The voice, commands him to bring the Central Power White Lantern Battery to the voice as well as an army, at which point Deathstorm brings back the Black Lantern versions of Professor Zoom, Maxwell Lord, Hawk, Jade, Captain Boomerang, Martian Manhunter, Aquaman, Hawkman, Hawkgirl, Deadman and Osiris. Deathstorm and the Black Lanterns teleport to an unknown location, Firestorm (Jason and Ronnie) ultimately seek the help from the Justice League. Firestorm arrive at the Hall of Justice asking for help. Firestorm is placed in a containment chamber while the League search for a way to stabilize the energy. However, an internal argument between Ronnie and Jason ignites the spark, apparently resulting in the destruction of the universe. Ronnie and Jason quickly notice, after defeating a hive of Shadow Demons, that the universe was not destroyed as they thought but they were actually transported to the Anti-Matter Universe. There they are contacted by the Entity who reveals to them that since Boston Brand has not yet found the one who will take the Entity's place, it is Firestorm mission to protect the Entity. Meanwhile, Deathstorm and the Black Lanterns are shown on Qward delivering the White Battery to someone. That someone is revealed to be the Anti-Monitor seeking to harvest the life energy within the Lantern to grow stronger. Firestorm takes the White Lantern and attempts to fight the Anti-Monitor, but is defeated. Deathstorm then brings Professor Stein out of his Matrix to taunt the two with. Deathstorm then attempts to turn Ronnie to salt, but the Professor takes the brunt of the attack. Angered, Ronnie decides to truly work together with Jason to avenge the Professor. The Entity then declares that Ronnie has accomplished his mission, returning life to him in a burst of white energy that obliterates the Black Lanterns, returns Jason's father to his home, and deposits Firestorm in the Star City forest. Ronnie angrily attempts to make the Entity resurrect the Professor, but is refused. Deadman then arrives, demanding that he be given the White Lantern. When the "Dark Avatar", made his presence known, Firestorm is part of the Elementals. Ronnie was then transformed by the Entity to become the element of fire and protect the Star City Forest from the "Dark Avatar" which appears to be the Black Lantern version of the Swamp Thing. The Elementals are then fused with the body of Alec Holland in order for him to be transformed by the Entity into the new Swamp Thing and battle against the Dark Avatar. After the Dark Avatar is defeated, Swamp Thing brought Firestorm back to normal. Afterward, Ronnie and Jason must find a way to contain their Firestorm matrix from the explosion in less than ninety days. After the events of the 2011 Flashpoint storyline, The New 52 reality altered Firestorm's personal history to be completely restarted. Ronnie Raymond is now introduced as a high school senior and the captain of the football team. During a terrorist attack on their school, classmate Jason Rusch produces a vial given to him by Professor Stein, which contains the "God Particle", one of Stein's creations. The God Particle transforms both Jason and Ronnie into Firestorm, and the two teens briefly battle each other before accidentally merging into a hulking creature known as the Fury. Sharing the identity of Firestorm, with Ronnie being the brawn and Jason being the brains, Firestorm is considered for recruitment into the Justice League along with several other heroes. They play a large part in the events leading up to the Trinity War, the three-way battle between the Justice League (the original headed by Batman, Wonder Woman and Superman), the Justice League of America (the A.R.G.U.S.-sponsored team led by Steve Trevor, Green Arrow and Amanda Waller), and Justice League Dark (the paranormal team consisting of John Constantine, Zatanna and the Phantom Stranger). When Superman is framed for the death of Dr. Light and the League is taken into custody, Amanda Waller has Firestorm experiment on their ability to create certain elements: specifically, the mass production of Kryptonite. It turns out that the two are indeed capable of using their powers to create it, but with some difficulty. However, this ultimately becomes moot once the Trinity War leads to the invasion of the Crime Syndicate, who supposedly kill the Justice League. In fact, the League is trapped inside Firestorm by his Earth-3 counterpart Deathstorm (a combination of Martin Stein and a corpse he experimented upon), with only Batman and Catwoman escaping the initial fracas. The Leagues are presumed dead for a time but are eventually freed from captivity after the Syndicate is defeated by Batman and Lex Luthor's Injustice League, Batman using Wonder Woman's Lasso of Truth to draw her and the others out of Firestorm. In the Watchmen sequel Doomsday Clock, Firestorm becomes a subject of controversy after claims arise stating that he was created by the American government. Firestorm profanely denounces the "Superman Theory" and insults his Russian counterpart Pozhar, much to the dismay of Martin Stein. Firestorm subsequently becomes embroiled in a fight with several Russian superheroes before appearing to inadvertently turn a crowd of civilian protesters into glass (a feat previously deemed beyond his capabilities). Firestorm flees with the body of an affected child and is found in hiding by Superman. With Superman's encouragement, Firestorm returns the child to normal. Firestorm and Superman return to the affected crowd and are engaged by the Russian military. The area then becomes engulfed in an explosion of blue light. Firestorm has the ability to rearrange molecular or particle structures of any substance into most anything else, creating different atomic structures of equal mass. He can transmute the basic composition of an object (e.g., transmuting lead into gold) and can also change its shape or form at will. Much like Green Lantern's limitations, Firestorm can only create items whose workings are understood by the "driver" of the Firestorm Matrix, through he can make more-complex sentient constructs out of the Matrix's energies. Unlike Green Lantern's creations, Firestorm's alterations are permanent unless he reverses them. Initially he could not affect organic matter without painful, even lethal, feedback (i.e., fatal biophysical disruption or even localized particle motion phenomena like extreme changes in the weather). It was later revealed that Firestorm could always change organic matter but opted not to. As Jason Rusch became Firestorm, however, this weakness appeared to have dissipated. With old and new variations the organic limitation does not extend to his own person, as its users can molecularly change their driver self at will, allowing them to regenerate lost or damaged bodily tissue, boost immune systems, shape-shift, increase physical capabilities and survive indefinitely without food, sleep, water or air. Capacities as such produce superhuman levels of strength, durability, stamina and resistance to injury great enough to challenge the New Gods – the likes of Orion, Lashina, or an empowered Kalibak – or surviving the rigors of outer space and sitting near the inner corona above the sun's photosphere without discomfort. Firestorm's power has been stated by Prof. Stein to be theoretically infinite, harnessing the spark of creation, the Big Bang itself. However, infinite power runs the risk of burning out its host. While the Firestorm Matrix can be utilized by a singular host driver – as was the case with Ronnie, Stein and Rusch – it is not recommended. The Matrix functions best with two people, a pilot and secondary, to comprehend and master it. Martin instructed Rusch on how to study current and potential powers available to them within the Matrix and to manually adjust them on the fly at a later date. Its main source of energy stemmed from the ambient stellar energies of native stars and suns but could also use its co-pilot as a power source, though they will burn out over time and genetically disintegrate if not properly adjusted to its power. The merging aspect of the Matrix can enable outside fusions which assimilate any inherent abilities these others might possess. However, this can diminish its effectiveness and stability. Rusch has shown he can spontaneously warp himself and others he had previously merged with to his specific location, triggering the neural pathway connection and allowing the gestalt to access each other's knowledge and memories to better utilize Firestorm's capabilities. Users of the Firestorm Matrix can access a type of ancestral memory from the continuum of past Matrix users, allowing them to access the latent knowledge of the atoms comprising it. This also translates into a form of time-space sight in which the Matrix user can glimpse the past, present, future and alternate lives of every other Firestorm throughout reality using a collective of subatomic wormholes which exist as a part of the Matrix. This power is too complex to properly control, thus it has been highly unreliable as an ability. The driver can fly at supersonic speeds in an atmosphere and reach escape velocities. The driver can also adjust the driver body's size or pull and enlarge others from the subatomic universe at will, Rusch having once dragged Ray Palmer from his microscopic size to the natural world while on Apokolips. Manipulation of the self at the subatomic level allows the driver to become intangible and pass through solid objects. This allowed Rusch to communicate with John Stewart and sift through his mind telepathically after he'd been taken over by the void beast. Firestorm is also adept at absorbing and redistributing radiation or energy both harmlessly and productively (such as in Green Lantern: Circle of Fire issue #7 having both absorbed Zeta Radiation from Adam Strange's body and repurposed it to turn a universe-destroying quasar back onto itself and absorb fallout from a massive nuclear detonation).). He can generate destructive or concussive blasts of nuclear energy, through which he can also channel his transmogrification powers. While the Matrix grants the fusers unique powers, it can also accidentally bestow them on individuals caught in the Matrix by mistake. One example is Nanette Phaedon, wife of the late Allen Phaedon, who gained the ability to change her quantum state for size shifting and flight by her own will. Following Raymond's resurrection during Brightest Day, Firestorm gained the ability to switch "drivers" between Ronnie and Jason at will; before that only the active driver was in control, with the dormant consciousness only able to advise the other on what action to take. One of the faults of a Firestorm fusion is that the stronger psyche will have dominance of the Matrix's power, such as when Jason fused with Luis Salvador who overpowered him from the passenger seat of the Matrix. During the New 52, the Firestorm Matrix could be shared through multiple users at a time. Users could fuse and become stronger but more unstable. The entity formed between Ronnie and Jason when using the Matrix in tandem created a nuclear being called "The Fury". It was also shown that The Matrix shares kinship to the Quantum Field in some way, enabling Firestorm users to derive its power for subatomic transmutation and manipulation. Some believe it is key to the fabled God particle theory. Its merging properties can place a large burden on the user; Firestorm runs the risk of reaching critical mass and detonating. At worst, the fusion of too many users in the Matrix could trigger a second Big Bang. Firestorm has appeared in various alternate realities within the DC Multiverse: a gender-reversed version appears in Countdown: The Search for Ray Palmer as an inhabitant of Earth-11; a version of the Ronnie Raymond Firestorm appeared in JLA: The Nail, as a captive of Cadmus Labs; a Firestork of the Just'a Lotta Animals; a Firestorm of a Justice League 100 years in the future, where Maxwell Lord has plunged humanity into a massive metahuman war appeared in Justice League: Generation Lost, and a merger of Ronnie Raymond and Nathaniel Adam of Earth-37 called Quantum-Storm who was summoned by Monarch in the miniseries Countdown: Arena. Firestorm's Crime Syndicate counterpart during the "Trinity War" event is introduced as Deathstorm from Earth-3. It is revealed that, on Earth-3, Professor Martin Stein would experiment on humans to unlock the secret of life through death. He was recruited by one of the Crime Syndicate's enemies to determine what the Syndicate's individual weaknesses were. However, he used the new lab he supplied to continue his human experimentation, eventually experimenting on himself, fusing with a corpse, becoming Deathstorm. He is killed by Mazahs, stealing his powers. In the alternative timeline of Flashpoint, Jason Rusch is killed by Heat Wave in an attempt to take his place in the Firestorm Matrix, alongside Ronnie Raymond, but is defeated by Cyborg. 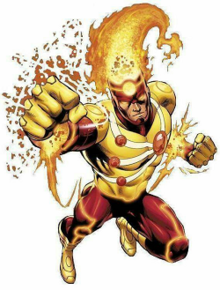 A version of Firestorm crafted by Anansi in Volume Two of Justice League of America, he appears to be a form of sentient red energy and is a member of that reality's Justice League. The original incarnation of Firestorm appeared in ABC's Super Friends: The Legendary Super Powers Show and The Super Powers Team: Galactic Guardians (the last two Super Friends series), voiced by Mark L. Taylor (Ronnie Raymond) as well as by Olan Soule (Martin Stein; first series) and by Ken Sansom (Martin Stein; second series). Firestorm was among the myriad planned guest stars in Cartoon Network's Justice League Unlimited animated series. Writer/producer Dwayne McDuffie said the producers had permission from DC Comics to use the character but the show's creators could not come up with a story that they liked, and revealed in Wizard magazine #197 that the producers intended to use the Ronnie Raymond / Martin Stein version as the focus character for the episode "The Greatest Story Never Told" but was replaced by Booster Gold. The Jason Rusch / Ronnie Raymond incarnation of Firestorm appears on the animated TV series Batman: The Brave and the Bold, voiced by Tyler James Williams (Jason Rusch) and by Bill Fagerbakke (Ronnie Raymond). This version consisted of intelligent youngster Jason Rusch's body and mind fused with science teacher/ex-jock Ronnie Raymond's muscle. Producer James Tucker said "the smart kid has the body and he's got this dumb guy in his head telling him stuff... it's kind of a total flip of the original Firestorm". Introduced in "A Bat Divided! ", the youth Jason and his coach Ronnie attend a class trip at a nuclear plant. The two are caught in the middle of Doctor Double X's supercharged nuclear energy and are fused together by accident. After being given a containment suit by Batman, Jason and Ronnie use their abilities to stop Doctor Double X. Jason decides on the name 'Firestorm' in the episode's final scene despite Ronnie liking the name 'Flame Dude'. Firestorm appears in "The Siege of Starro!" two-parter among Batman's rag-tag group of heroes with Booster Gold, Captain Marvel and B'wana Beast to fight Starro. Firestorm realizes that a host can be freed by overloading the Starro clone with energy. When Billy Batson yells 'Shazam!' and the lightning hits Starro, Firestorm hits upon the idea to use the lightning for Starro's initial defeat. Firestorm later fights alongside many other superheroes to defeat Starro's titan form. Firestorm returns in the teaser for "Darkseid Descending! ", assisting Batman in stopping Killer Frost (Louise Lincoln), Ronnie's ex-girlfriend. Franz Drameh and Victor Garber reprise their roles as Jefferson Jackson and Martin Stein in the web series Vixen. The Ronnie Raymond / Martin Stein version of Firestorm appears in Justice League Action, voiced by P.J. Byrne (Ronnie Raymond) and by Stephen Tobolowsky (Martin Stein). The origin story is very similar to the classic origin. When Stein had just turned on a nuclear reactor, some criminals went in to steal plutonium. The criminals had kidnapped Ronnie from a field trip as a hostage. The criminals decided to throw some grenades to blow the reactor up. In the blast, Ronnie and Stein were fused together, creating Firestorm. Firestorm first appears in "Nuclear Family Values" where Firestorm had to prevent the Nuclear Family from blowing up a nuclear plant. With Martin's guidance, Firestorm was able to shrink them down. Afterwards, Firestorm is recruited into the Justice League. In the episode "Freezer Burn", Firestorm works with Batman where they fight Mr. Freeze who is freezing Gotham City with a special freeze gun on an airship that is powered by Killer Frost (Caitlin Snow). In the episode "Field Trip", Firestorm, Blue Beetle and Stargirl are given a tour of the Fortress of Solitude by Superman when General Zod, Ursa and Quex-Ul are accidentally freed. With Superman incapacitated, Firestorm with guidance from Martin works at making Kryptonite while Blue Beetle and Stargirl fight Zod's group. Firestorm transmutes some of the ice into Kryptonite which weakens the Kryptonian villains. In the episode "Double Cross", Firestorm assists Batman and Plastic Man in their plot to apprehend Deadshot. The episode "The Cube Root" revealed that Martin was a former college roommate of former child prodigy Michael Holt. Robbie Amell as Ronnie Raymond/Firestorm with Victor Garber as Martin Stein in the background. Franz Drameh as Jefferson "Jax" Jackson/Firestorm in Legends of Tomorrow. Firestorm is featured in the CW's Arrowverse, with Professor Martin Stein portrayed by Victor Garber, Ronnie Raymond portrayed by Robbie Amell, and Jefferson "Jax" Jackson portrayed by Franz Drameh. Firestorm first appears on the 2014 series The Flash, with Ronnie Raymond and Professor Martin Stein as the two halves. Ronnie is an engineer at S.T.A.R. Labs and Caitlin Snow’s fiancé while Professor Stein is the creator of the F.I.R.E.S.T.O.R.M. matrix. Ronnie is presumed deceased from the particle accelerator explosion while saving his co-workers' lives. However, he survived and merged with Stein, having the matrix on his persons, to become the entity later named Firestorm. The two spend months trapped together, with Stein in primary control of Firestorm, until Caitlin discovers information from Jason Rusch (Luc Roderique), Stein's old assistant. Harrison Wells manages to separate the two, and they eventually learn to control their shared powers; Ronnie spends time with Caitlin while Stein reunites with his wife Clarissa Stein. Firestorm has a confrontation with Wade Eiling, which compels Martin and Ronnie to go into hiding. Firestorm later assists Barry Allen and Oliver Queen in a fight with the Reverse-Flash. While helping Team Flash, Ronnie finally marries Caitlin (with Martin officiating), while Stein gives Barry and Eddie Thawne some insight on time travel possibility and their respective destinies. A scene introducing Firestorm's ability to manipulate matter was filmed but was ultimately cut due to time constraints. When a singularity threatened Central City, Barry contains the singularity and Firestorm flies into to disrupt the singularity, triggering the halves' separation but Barry is only able to recover Stein while Ronnie is presumed dead (It's uncertain whether Ronnie is truly deceased or possibly trapped on another Earth or timeline). After the deaths of Eddie and Ronnie, Professor Stein becomes a member of Team Flash as the group's scientific advisor. Stein also discovers Cisco Ramon's metahuman status, encouraging Cisco to accept these new abilities and to tell the others. Unfortunately, Stein exhibits symptoms that the Firestorm matrix has become unstable without a partner, endangering Stein's life. When Team Flash searches for a likely candidate among people who have been affected by the dark matter explosion in a similar manner who also possess the same blood type, Jax Jackson ultimately becomes the new partner. A former high school football star (like Ronnie in the comics), Jax gets injured by the particle accelerator explosion, ending his collegiate career before starting. Jax is hesitant at first to become Firestorm's new half but agrees when the only other candidate uses the powers for revenge. Jax and Stein later leave Central City to train in using their Firestorm powers. When Barry, Cisco and Harry Wells travel to Earth-2, Deathstorm (Ronnie Raymond's Earth-2 counterpart) is encountered. In addition to being Killer Frost's significant other, Deathstorm is Ronnie in control as he hasn't let his partner out in years and can no longer hear him. When Deathstorm and his boss Reverb nearly kills Barry, Zoom kills Reverb and Deathstorm both, leaving Killer Frost to mourn Ronnie's death. Stein later appears with Jax and the Legends during an alien invasion. Ronnie's likeness later appears to Barry in the Speed Force as part of a series of visions of those allies who have died due to Barry's actions. In a reality where Music Meister trapped Kara Zor-El and Barry, Stein is featured as the unnamed husband of Joe West's crime lord counterpart Digsy Foss. Firestorm also appears in the spin-off Legends of Tomorrow, with Martin Stein and Jax Jackson as the two halves while Graeme McComb portrays the former's younger incarnation. In season one, Jax was initially uncertain about participating in Rip Hunter's mission, to the extent that Stein had to knock him out to get him to come to the final meeting. However, Jax comes to appreciate the chance to be part of the team on such a significant mission when he witnesses them all taking action while under fire from time-travelling hitman Chronos. During a trip to 1975, Stein has a brief encounter with his younger self that nearly results in him missing the faculty meeting where he met his future wife, but Hunter is able to erase the younger Stein's memory so that history unfolds as it should. During a trip to 1986, following a period of tension as Jax becomes frustrated with Stein ordering him around, Stein is forcibly merged with Valentina Vostok and Lt. Mikhail Arkadin (Voytek Skrzeta) to create a Soviet Firestorm, but he is able to break free of the sociopathic villains with Jax's encouragement as he recognizes that Stein was only trying to protect him after losing Ronnie; the separation and improper merge trigger an explosion that apparently kills Valentina, Arkadin and destroys the Gulag where she worked. Jefferson is briefly sent back to 2016 after he is exposed to temporal radiation that causes his internal organs to age at an accelerated rate, but traveling back to the past heals his injuries, and he is able to return to the future and rescue his allies when they are captured by the Time Masters by working with a version of Stein from just after Rip made his offer but before they left in the Waverider. The season one finale introduces Firestorm's ability to transmute matter, subsequently turning a meteor into water before Vandal Savage could use it as part of a complex plan to undo history. In season two, Stein briefly takes on the role of team leader after Rip disperses the team across history while trying to stop a nuclear bomb destroying New York in 1942, but Sara Lance takes on the role instead as Stein is forced to acknowledge that he is less qualified to be a field leader. During a trip to 1987, Stein has a new encounter with his younger self, which results in his past self being stabbed by Damien Darhk as the villain acts as an advisor to the White House during a disarmament project with Stein berating his younger self for his attitude towards his wife. In the crossover "Invasion", Stein receives new memories of a timeline caused by both the Legends' and the Flash's time-traveling, in which he now has a daughter (Lily Stein). Stein is morally conflicted about the alteration of his life despite being happy to be a father; he becomes close and protective to Lily and thus accepting his new life as a parent. By season three, Stein has become a grandfather after Lily has Ronnie (named after his original Firestorm partner), prompting Jax to ask Ray Palmer for help in working out how they might separate the Firestorm matrix so that Jax can channel the power on his own. During the "Crisis on Earth X" crossover, Stein is badly injured trying to help the heroes escape Earth-X and Jax gets injured as well due to the connection of the Firestorm matrix. Stein sacrifices himself by drinking the formula created to separate the Firestorm matrix, saving Jax's life. Afterwards, Jax, still distraught over Stein's death, attempts to change history when events lead to them making contact with a version of Stein from 1992, but the younger Stein rejects the offer of changing his future in favor of accepting the good life he already knows he will experience in history as it stands, prompting Jax to depart the Legends to heal from his grief. Jax returns in season three's finale to help the Legends in the final battle against the demon Mallus, but this version of Jax is presented as having been away from the team for five years, now happily married with a daughter named Martina after his deceased partner. The Jason Rusch version of Firestorm appears in Justice League: Crisis on Two Earths, voiced by Cedric Yarbrough. He has a brief appearance, but it is not clear if he is merged with Martin Stein, Ronnie Raymond or operating on his own. Batman, realizing that he is outnumbered by several super-villains from a parallel earth, teleports Firestorm along with several other super-heroes to defend the base. Firestorm engages in battle with one of the "Made Men" from the alternate Earth, and is seen to use molecular manipulation powers to imprison his foe in the floor plating of the Justice League's incomplete space station. When the super villain easily shatters the plating, Firestorm realizes that he is outmatched, and switches tactics, trying to overwhelm his opponent with energy blasts. Although he is knocked down and nearly finished by the enemy, Black Canary uses a well-timed scream to save him. Aside from briefly appearing in the dust of a demolished command center, he is not seen again until the end of the movie, when it is implied that Batman has invited him and the rest of the emergency help to join the Justice League. Additionally, an alternate version of Firestorm, from a parallel universe, appears briefly onscreen among the Made Men. The Jason Rusch version of Firestorm appears in Lego DC Comics Super Heroes: The Flash, voiced by Phil LaMarr. The Ronnie Raymond / Martin Stein version of Firestorm appears as a playable character in Lego Batman 3: Beyond Gotham, voiced by Nolan North. The Earth-3 incarnation of Martin Stein as Deathstorm appears as one of the central antagonists in Lego DC Super-Villains, voiced by Lex Lang, and the Jason Rusch / Martin Stein version of Firestorm is a playable character. The Jason Rusch / Martin Stein version of Firestorm appears as a playable character in Injustice 2, voiced by Ogie Banks (Jason Rusch modeled after Jax Jefferson) and by Fred Tatasciore (Martin Stein). In the game, Firestorm is an ally of Batman, helping restore order to the planet after High Councilor Superman's defeat. They and Blue Beetle are selected by Batman to guard Superman's cell at the Lex Luthor Memorial Prison from the remaining Regime members and Brainiac's forces. When they start to get overwhelmed, Firestorm threatens to destroy the facility with their nuclear power but refrain after Batman arrives and frees Superman. Afterwards, Batman chastises the duo for their recklessness and has them create a golden shard of Kryptonite to use in case Superman goes rogue again. They are later brainwashed into serving Brainiac but are saved by Batman and Superman. In their ending, Firestorm tries overheating the Skull Ship's engines to defeat Brainiac but the process causes the ship to explode and destroy the thousands of the collected worlds within. Though they know the heroes will never look at them the same way again after their mistake, they still pledge loyalty to helping Batman if needed. The Ronnie Raymond version of Firestorm appeared in the Robot Chicken DC Comics Special, voiced by Alfred Molina. He was featured in the second part of the segment "Real Characters From the DC Universe" where the narrator (voiced by Kevin Shinick) of that segment doesn't take him seriously. In the third part of "Real Characters From the DC Universe", Firestorm enters where he is not happy about being lumped in with Mister Banjo who Firestorm refers to as "Fatty Arbuckle" and states that he can fly, shoot nuclear blasts and can literally turn lead into gold. Mister Banjo replies to Firestorm that his banjo cost him almost $60.00 so they both "bring a lot to the table". Firestorm ends up transmuting Mister Banjo's banjo into steel to knock out Mister Banjo with. Firestorm then demands from the narrator where B'Dg (having been featured in the first part of the segment as another ridiculous DC character) is located and the narrator tells Firestorm that B'Dg is "down the hall, first dressing room on the right." Firestorm then heads there and hits B'Dg with the banjo. ^ a b "'The Flash': Robbie Amell Cast as Firestorm". Variety. 9 July 2014. Retrieved July 9, 2014. ^ a b "'The Flash' Casting: Victor Garber To Recur As Dr. Martin Stein". Deadline Hollywood. October 9, 2014. Retrieved October 11, 2014. ^ a b Damore, Meagan (July 20, 2016). "CASSIDY'S BLACK CANARY, ATOM & MORE WILL APPEAR IN "VIXEN" SEASON 2". Comic Book Resources. Retrieved July 20, 2016. ^ a b Conway, Gerry. "Nuclear Reactions: Just Your Average Hot-Headed Hero," The Fury of Firestorm #1 #1 (June 1982). ^ Thu, 06/02/2011 – 10:00am (2011-05-31). "The New Justice | DC Comics". Dcu.blog.dccomics.com. Retrieved 2013-11-25. ^ "Joe Harris Replaces Gail Simone as "Firestorm" Co-Writer". CBR.com. 6 December 2011. Retrieved 19 January 2012. ^ Doomsday Clock #5 (May 2018). DC Comics. ^ Doomsday Clock #8 (December 2018). DC Comics. ^ "The Justice League Watchtower: The Greatest Story Never Told". Jl.toonzone.net. Retrieved 2011-04-21. ^ "'The Flash': Robbie Amell returning — but there's a twist!". Ew.com. Retrieved 24 October 2018. ^ Abrams, Natalie (January 12, 2017). "The Flash: Robbie Amell returning in season 3:!". Ew.comEntertainment Weekly. ^ Andreeva, Nellie (February 26, 2015). "Arrow/Flash Superhero Team-Up Spinoff In Works At CW; Brandon Routh, Victor Garber, Wentworth Miller, Caity Lotz Star". Deadline Hollywood. Retrieved February 27, 2015. ^ Sunu, Steve (11 November 2014). "Roderique Cast As 'The Flash's' Jason Rusch". Comic Book Resources. Retrieved 8 January 2015. ^ Cairns, Bryan (May 19, 2015). "Amell Teases Wedding Bells, Tragedy & Matter Manipulation in "Flash's" Season Finale". Comic Book Resources. Retrieved May 21, 2015. ^ LEGO DC Game (19 July 2018). "Official LEGO® DC Super-Villains SDCC Trailer". YouTube. Retrieved 24 October 2018. ^ "LEGO® DC SUPER-VILLAINS REVEALS DARKSEID'S VILLAINY IN ACTION IN NEW CLIP". mailchi.mp. Retrieved 24 October 2018. ^ Romano, Sal (2017-03-13). "Injustice 2 adds Firestorm". Gematsu. Retrieved 2017-03-13. ^ "Characters: Injustice 2". Injustice 2. Retrieved 24 October 2018. Firestorm at Don Markstein's Toonopedia. Archived from the original on July 29, 2016. Brady, Matt (July 8, 2006). "From The Files of Professor Martin Stein". Newsarama. Archived from the original on December 11, 2008.